EMDR Multi Home is a simplified multi-platform version of our PC based EMDR software, EMDR Home designed for guided home use by the patient's of EMDR therapists. EMDR Multi Home runs on the PC, Mac and Linux platforms and is suitable for use by patients / clients when at home as directed by their therapist. Therapists should use EMDR Multi Pro or EMDR Pro. 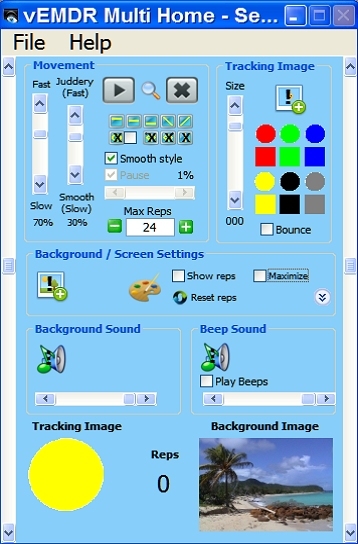 Non-standard saving / reloading of settings, tracking images, background images, beeps and background audio features are disabled in this version. We provide a range of image files suitable for tracking and background purposes based on a selection from our shared multimedia library. You may add to this library yourself or choose a file from somewhere other than our library. The choice is yours. * These features can depend on the hardware that the system is being run on. 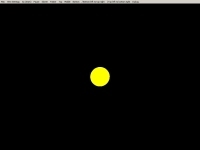 Round images may appear to be oval with some wide-screen monitors. 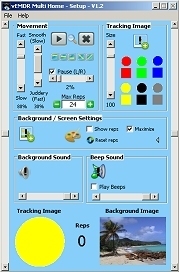 EMDR Multi Home is a reduced functionality version of EMDR Multi Pro. Windows Netbook use is supported. You are advised to use with the Netbook plugged into mains power and to close all other applications when using EMDR Multi to assure smooth tracking. V1.8a - 23 Oct 2014 - New release including new tracking mode for Macs only, updated internal help file and correct display of reps in Mac mode. How do I purchase? How much does it cost?